Mor Ignatios Elias III was the 119th legitimate successor to St. Peter on the Holy Patriarchal See of Antioch. The second son of Chorepiscopus Abraham and Maryam, he was born in Mardin and christened Nasri. He had 4 brothers and 3 sisters. After the death of his mother, Nasri was raised in the care of his elder sister Helena. He worked as a shoemaker in his teens and served in the government briefly for 3 months. At Patriarch Peter IV’s direction, Nasri joined the theological school in the name of the forty martyrs. In 1887, he joined Deir al-Za`faran and was ordained deacon in 1887 by Patriarch Peter IV. He became a sharwoyo (novitiate) in 1888 and a monk in 1889 upon which he took the name Elias. Elias was ordained qashisho (priest; lit. presbyter) in 1892 by Patriarch Peter IV. In the waning years of the 19th century, numerous Armenian and Syriac Christians were massacred in Turkey. Qashisho Elias endeared himself to the Armenian Christians providing refuge for about 7000 in the monastery of Mor Quryaqos. He was later appointed the reesh dayroyo of the Mor Quryaqos as well as Deir al-Za`faran. 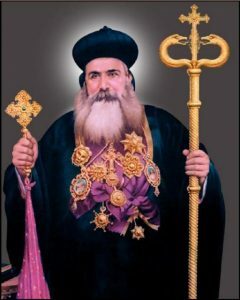 In 1908 Qashisho Elias was consecrated bishop of Amid (Diyarbakr) by Patriarch `Abded Aloho II with the name Mor Iwanius. In 1912, he was transferred to Mosul where he served until his elevation to the patriarchate in 1917. After Patriarch `Abded Aloho passed away on Nov 26, 1915, Mor Iwanius was elected Patriarch and assumed the throne in 1917. The firman (decree) was issued by the Ottoman sultan Muhammad Rashid, who Patriarch Elias III visited in 1919 at Istanbul; the sultan conferred the Ismania medal on the Patriarch during the visit. In 1922, when civil war broke out in Turkey and Gazi Mustafa Keman Pasha assumed leadership of the newly formed democracy, Mor Elias III spent a few months in Jerusalem. He established a printing press there and began publication of journals in Syriac and Arabic. Mor Elias III was the last Patriarch to reign at theÂ Kurkmo DayroÂ (Deir Za`faran) in Mardin, the seat of the Patriarchate for most of the second millenium. Following the massacre of the Syriac Christians in South East Turkey in the waning days of the Ottoman Empire and during World War I, the Patriarch was forced to leave Mardin. In the aftermath of theÂ sayphoÂ massacres, Mor Elias III undertook pastoral tours in the Middle East, the first in 1919 and the second in 1925 to Aleppo and Jerusalem. Mor Elias III held a synodÂ Dayro d-Mor MatayÂ in 1930. Lord Irwin, then British Viceroy to India, wrote to the Patriarch on December 1, 1930 requesting his intervention in person or through a delegate in resolving the schism that had erupted in the Malankara Church. His Holiness responded to the Viceroy’s letter accepting his invitation with certain conditions on December 15, 1930. Given his cardiac problems, his doctors attempted to dissuade him from the trip in vain. His 75 year old sister also could not persuade the Patriarch; His Holiness said to her, “Death is inevitable whether here or in India; I would rather sacrifice my life for the sake of our children in Malankara.” Mor Elias III left Mosul on February 6, 1931 accompanied by Mor Clemis Yuhanon Abbachi, Rabban Quryaqos (later Mor Ostathios Quryaqos), and Rabban Yeshu` Samuel (laterÂ Mor Athanasius SamuelÂ of North America), his secretary Zkaryo Shakir (his brother Joseph’s son) and translator Elias Ghaduri. They set sail to India on February 28, 1931 from Basra on the ship “Warsova” and disembarked at the Karachi port on March 5, 1931. They were received at Karachi by the Patriarchal DelegateÂ Mor Yulius Elias Qoro,Â Mor Athanasius PaulosÂ of Alwaye and several clergymen and faithful. On March 6, 1931, the Patriarch and his entourage proceeded to Delhi by train reaching there on the 8th and visited Lord Irwin. On March 14th, the Patriarch arrived at Madras and stayed as a guest of the British Governor Sir George Staly. From there, he arrived at the Thrikkunathu Seminary in Alwaye on March 21st, and offered the divine liturgy there on March 22nd. H.H. Mor Elias III convened conciliatory meetings at Alwaye, Karingachira, Panampady and Kuruppumpady. The Patriarch lead the passion week services atÂ Karingachira. A church delegates meeting was held at Kuruppumpady on July 5, 1931. ThedenhoÂ (Epiphany) services in January 1932 were at the church in Pakkil. On February 11, 1932, at the invitation of Qashisho Kuriakos Elavinamannil, the Patriarch arrived at the Manjinikkara Mor Stephanos church from Kallissery. The inability to bring about reconciliation in the church had weighed down heavily on the Patriarch; moreover, the hardships of the long travel had taken its toll on His Holiness. On arriving at Manjinikkara, the Patriarch said, “This place offers us much comfort; we desire to remain here permanently.” On February 12th, His Holiness requested the priests who came to visit him not to leave for a couple of days. In the evening, the Patriarch recited many prayers of theÂ qandiloÂ (unction) and contemplated on the departed. On February 13th, Mor Clemis Yuhanon Abbachi offered the HolyQurbono; His Holiness gave the sermon during the liturgy. After the noon prayers and lunch, as was his routine, the Patriarch spent time recording events in his journal; he asked for a dictionary to get clarification for the meaning of a word. Following that, he paced about complaining of pain in his head. Soon he fainted and was placed on a cot by the monks where he slipped away into eternal rest at 2:30 pm. Many eye witnesses recount the deep gloom that cast its spell in the area that evening and the wails of the monks who accompanied the Patriarch. Different opinions arose regarding the final resting place for the Patriarchâ€”a situation that the church in Malankara never had to confront before. The decision was in favor of interring the mortal remains in a plot of land to the north of the Mor Stephanos church, the title deed of which was transferred to the Patriarchate. On February 14th, the funeral services for His Holiness were held there. TheÂ Mor Ignatios DayroÂ church was built by the Patriarchal delegate Mor Yulius Elias Qoro over the tomb of the late Patriarch. 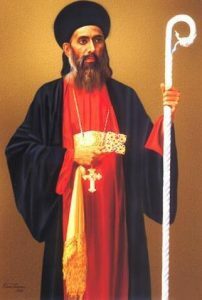 Maphryono Mor Baselios Yeldho was born in a village called kooded (now known as Karakosh) near Mosul in Iraq where Morthsmooni and her 7 children suffered martyrdom. At a very young age he joined the Mor Bahnan Monastery and become a monk. In 1678 he was consecrated Maphryono (Catholicos) by the Patriarch of Antioch Moran Mor Ignatius Abdul Masih I. In 1685 at the age of 92, the holy father started the difficult mission to India at the request of Mor Thoma II of Malankara who informed the Patriarchate about the unpleasant situation of the Church here. The saintly Maphryono was accompanied by his brother, two monks and an Episcopo (? ), but only three of them is believed to have reached Malankara. The saint expired on Saturday afternoon on ‘Kanni 19’ (Malayalam Calendar), 1685 and was entombed on the very next day in the sanctuary of Mor Thoma Cheriapally, Kothamangalam. Though the holy father had lived in this land for only a few days, his name has spread far and wide leaving a lasting mark in the history of Malankara Syrian Church. 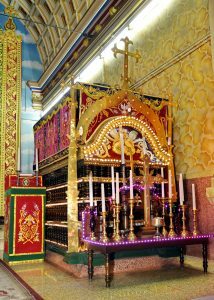 The mission undertaken by the saint was fulfilled to a large extent by his faithful associate, Metropolitan Mor Ivanios Hidayatullah (entombed at Mulanthuruthy Marthoman Church). The Sacred tomb of the holy father is a great solace for many; large groups of pilgrims, irrespective of caste and creed come to the church every day seeking his intercession and more particularly on annual feast days and also on every Saturdays. A great number of miracles are happening by the intercession of the holy father. It is a common practise among the parents to name their long awaited sons as ‘Yeldho’ and ‘Basil’, who they believe will be protected by the saint like a guardian angel. Dhukrono of St. Baselios Yeldho Bava is celebrated in the Mor Thoma Cheriapally with spiritual grandeur every year on October 2 and 3 and this feast is popularly known as ‘Kanni 20 perunnal’. Fulfilling the wishes of multitude of faithful, the Holy Church in 1987 included the name of the holy father in the 5th Tubden (Holy diptych) along with the names of Patriarch St. Ignatius Elias III and St. Gregorios of Malankara. St. Gregorios Geevarghese, popularly known as “PARUMALA THIRUMENI” was born in the distinguished priestly family of ‘Pallathattu Thanagattu’ in the village of Mulunthuruthy near Cochin, India on 15th June 1848. He was baptized by name Geevarghese (George) at the Mulanthuruthy Mar Thoman Church. Geevarghese’s mother died when he was a small boy and since then he was under the loving care of his elder sister Mariam. From childhood days he followed a very disciplined life which was enriched by prayer and fasting. ‘Kochaipora’ as he was known in those days, had a deep fascination towards Syriac, the liturgical language of the Syriac Orthodox Church. His extraordinary ability to sing Syriac hymns beautifully & perfectly came to the notice of his uncle (father’s brother) Malpan Kassisso Geevarghese who was an authority in Syriac and a celibate priest. Impressed by his nephews’ extraordinary divine qualities Kassisso Geevarghese gave proper guidance to him. The other two personalities who had greatly influenced young Geevarghese were Malpan Kassisso Geevarghese Konattu (later Geevarghese Mor Julius) and St. Yuyakkim Mor Koorilos Bava, the Syrian Metropolitan who was the Reesh Episcopa to Malankara. The later years the Malankara church was witnessing the emergence of a great monk who through continuous prayers, made it clear to the world that Prayer and devotion is mightier than any worldly possession. The Holy Father’s short life was remarkable in many respects. A deacon at the age of 10, a priest at the age of 18, a bishop at the young age of 28 (the reason for calling him ‘Kochu Thirumeni’); he passed away at the age of 54 on 3rd November 1902, after a saintly life of prayer to become the brightest jewel of the Universal Syrian Church.